Most of us are already aware of this fact that Apple TV is one of the most sought after streaming media players worldwide. With its high quality video streaming services and the highest order of entertainment quotient involved, AppleTV has ruled the IPTV landscape with an unmatched authority and dominance in the past few years. We may say that it does a fair justice to its tagline - “One Box That Simplifies It All”. Besides, Apple TV has its other unique benefits which include voice-search enabled remote called Siri, wi-fi connectivity to run most of the online video apps, access to hundreds of popular video games that can be played on an HD television. Further, the launch of the 4th Generation Apple TV in 2015 brought us the most refined version of Apple TV media streaming box ever which provided an updated version in graphics & screen resolution alongside an introduction to tvOS App Store. Another handy advantage of Apple TV media player is that it provides you with a unique functionality called Apple TV airplay via which you can run the content or the apps on your iphone or ipad on your HD television. This process is also sometimes called mirroring. By the way, mirroring ios devices is a lot of fun when it comes to playing ios games on an HDTV in your living room. Problem : Encountering stuttering or lag while trying to airplay content on your Apple TV via your iphone or MAC and the devices are not able to detect each other. Solution - Firstly check that whether your device and the Apple TV both, are on the same wifi network or not. Then, you need to check that both your devices are running the latest ios/tvOS software and whether you have another device on the same network consuming the major part of your network bandwidth(broadband bandwidth). Also, if there are any software updates or large downloads/uploads processing at the same time, it could affect the network connectivity. If still the issue has not been resolved, then you must restart your router, Apple TV and the wireless access point and then continue with the above mentioned remedy measures again. Problem : Your Apple TV might not find the wi-fi network or face difficulties in joining the network. There are other ways too wi-fi connectivity can create problems which include Apple TV not being able to connect to the wi-fi in a stable manner and the connection gets lost more frequently. Solution - Open Settings>Network and try to check whether an IP address shows up. If no IP address appears, you should try to restart your Apple TV and the router (Settings>System>Restart). And if IP address does appear but the wifi connection doesn’t appear to be strong enough, then try to move your wireless access point closer to the Apple TV media player box. For this, you can make use of an ethernet cable or you might consider purchasing a Wifi extender (like Apple Express unit) to maximise the signal strength in the immediate vicinity of your Apple TV streaming box. Problem : You have opened your Apple TV and are navigating through different AppleTV apps when suddenly you realised that background sound is missing. Or when you are playing a game, watching a movie or playing an audio track using any of your tvOS apps, there comes no sound. Even when you have turned on the audio on your TV, you are still unable to find any sound coming out of your TV. 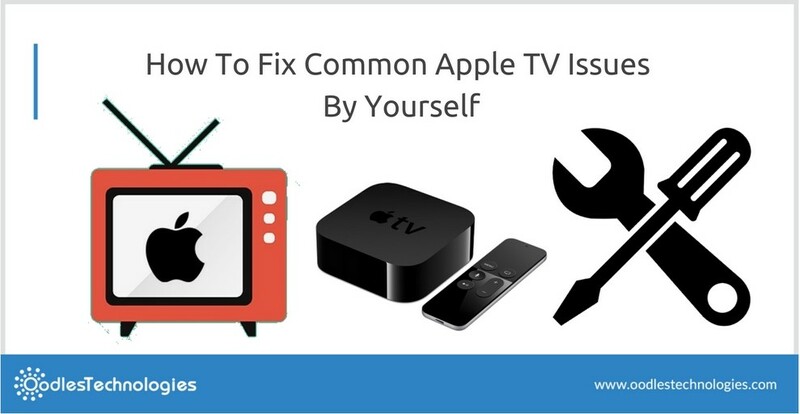 Solution - This is a common Apple TV issue that many of the Apple TV users have reported in the past. The best solution to this common fault is to Force Restart your Apple TV. In Settings, go to Settings>System>Restart, or you can do this by long pressing the Home and Menu buttons simultaneously on your Siri remote till the time light starts to flash on the front of your Apple TV box. Otherwise, you can also unplug your Apple TV for six seconds and then try to plug in again. Problem : Nothing happens when you click, swipe or touch on your Apple TV remote. Siri doesn’t respond at all. Solution - Go to Settings> Remotes and Devices > Remote. Search for your remote in the list and then tap on it to check how much battery power is left on it. The most likely reason of your Apple TV remote not working could be full battery drain. To fix this issue, you need to plug in your Siri remote into a power source by using a lightning cable to recharge it back again. Problem : You have downloaded a lot of movies, games and apps but suddenly a pop-up appears saying that your movie, game or app cannot be processed or played because the device has gone out of space. Don’t worry too much about this streaming issue as Apple TV has its limited media storage capacity and it can store upto a certain extent only. So, in that way, at one time the memory will get loaded to an extent after which it cannot accept more. Solution - This problem is quite simple to resolve. Go to Settings>General>Manage Storage and try to browse through the list of apps that you have installed on your Apple TV device. Against each app, the amount of space it is consuming on the memory will be mentioned. Now, you need to delete those apps which are consuming a considerable space and are not even used by you very often. By the way, you can download these apps back from the Apple TV App Store whenever needed. Simply select the Trash icon against such apps and then tap on the “Delete” button to finish with deleting them in order to free up your Apple TV storage space. I hope this blog will succeed in resolving most of your issues related to fixing Apple TV. And if still the problem has not been fixed, you need to contact Apple Support. Copyright 2009-2019 OodlesTechnologies. All rights reserved.